When you have got started with the blues, then Essential Blues Guitar eBook will enable you to reach the next level. We'll cover many different blues forms, chords and a number of classic endings. 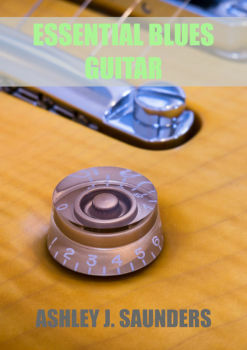 This guitar ebook contains something for all guitarists, no matter what skill level you are. 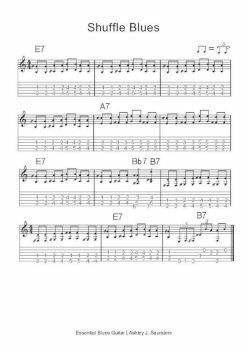 If you have purchased and learnt from Get Started with the Blues eBook, and want to take it a step up in your guitar playing, then this is the right ebook for you! In Essential Blues Guitar eBook, you will discover 12 different blues forms. 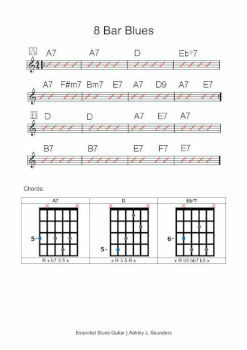 Including a simple blues form to be-bop jazz blues, a far more advanced form. Along the way, we'll look at all the guitar chords you need, both in general and specifically for each form. In the second section, we'll look at 12 classic endings, all of which can be used straight away and sound fantastic. This guitar ebook contains something for everyone no matter what skill level you are. 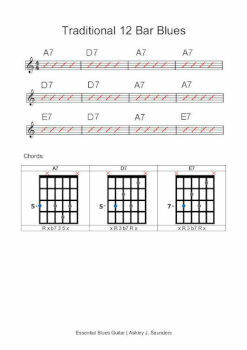 This eBook is aimed at those who already have a good understanding of the blues and want to explore the style further.